If you're someone who's been drinking craft beer for a while, cast your mind back. Back to when the Great Australasian Beer SpecTAPular was merely the Great Australian Beer SpecTAPular. Back when it was a one-day event featuring 20 new Aussie beers brewed for events at The Local Taphouses in St Kilda and Darlinghurst. Back before it became the behemoth it is today. Among the beers brewed for the day was a black IPA, then a very new concept in Australia only attempted by one or two commercial brewers. It was sent over from WA by Feral for the events back in the days when they sent bugger all beer outside their home state, had the suitably punsome title Karma Citra (because it featured heaps of Citra hop) and, along with the Wee Heavy from 4 Pines and Maibock from Hills Hargreaves and Red, was the standout beer for us. It's since been brewed with some regularity by Feral, appearing here and there, now and then, on taps across the country. And now it's won a promotion; yes, more than four years after its birth it's becoming part of the brewery's core range. 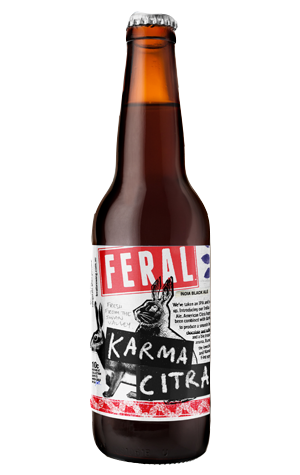 For those yet to indulge in a little Karma Citra, it's a cracking combination of punchy citrus hops supported by the smoothest of chocolate and soft coffee malts and, on the opening night of Good Beer Week in 2015, became the first beer ever sampled by City of Melbourne Councillor (and Miss Australia 1978) Beverley Pinder-Mortimer, instantly turning her from non-beer drinker to craft beer advocate. Best let it win you over too!